as named is the mother of 10,000 things. Wayne always said that there are no such thing as coincidences and it was no coincidence that I decided to to study/live the first verse of the Tao-Te Ching when I did. In his essay, he recommended to “Let the world unfold without always attempting to figure it all out” and to “simply allow” as a way to live this verse. Keeping this in mind I was able to transcend some adversity that normally I would have attempted (and usually failed) to control. Instead, I let it go and observed as everything unfolded as it should. I believe the results were more positive than if I would have intervened and less stressful. I learned that tensions and issues took longer to resolve when I “let it be” but in return, I have witnessed changes in the dynamics of my relationships that I are stronger and will last longer. Me forcing the issue and trying to resolve ASAP only created more tension and the issue usually bubbled up to he surface again and again. The process became circular and exhausting and was the norm in my relationships; both work and personal. It wasn’t working and created a lot of negative energy in my life. Does this mean that I just let something happen that should be stopped or should I just “put up” with? No, not at all but the reality is that the the people in my life don’t need me to “guide” them into doing something that I feel that should do or how to do it; especially when they haven’t asked for that help. Just like anything, this takes practice, practice and more practice. I had to be mindful of myself everyday until it became habit. I feel the shift in my energy from practicing this one verse over the course of about three weeks. Very thankful to Lao Tzu for writing this and Wayne Dyer for bringing it into the 21st century. 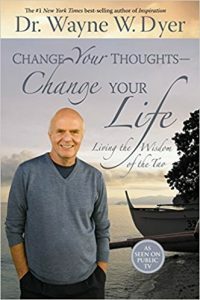 Wayne Dyer wrote “Change Your Thoughts-Change Your Life – Living the Wisdom of the Tao” where he read, analyzed and meditated on different interpretations of the Tao-Te Ching. He then wrote an essay for each of the 81 versus which has given all of us a guidebook on “the way” aka the Tao. He recommended to read an essay a day and in that day, reflect and meditate on the meaning of the verse and how it applies to you. Wayne did all the hard work and I am grateful because his essays put the Tao-Te Ching in plain english that I can understand. He wrote in his preface that he had everyone in mind when he meditated and wrote. Not just politicians, business people or some who is famous; all of us were in his thoughts. He made it so easy that I read through it pretty quickly and while some versus stood out to me, others I just read right though but on my second go around, things will be different. In my second reading of this book, I will follow Wayne Dyer’s example and meditate, ponder and practice each verse for a number of days until my spiritual muscle memory is established. This may take a few days or a week or so, I will follow my gut on this one and only move on to the next verse when I feel I’m ready. And, of course, I will also write my thoughts and post them to this blog. I have a feeling this endeavor may take a little bit longer than the year it took Wayne. It will be worth it! So stay tuned and Verse 1 is coming up! Is it a setback or an opportunity? The doorbell rings and FedEx drives away. With eager anticipation, I rip open the envelope to look over the contents. Background: I’m trying to refi my house so I can get my ex-wife off of the loan. It’s been a long time since the divorce and she is still tied to the house. In order to get this refi to happen I need to have at least 20 percent equity in the house so the loan to value is 80. I have overpaid for years to get the balance down and I always tell my friends that if you want to really commit to someone, buy a house with them. It’s not easy to get them off of the loan and thankfully my ex is very understanding of the predicament. But I imagine, she would like to buy a house someday and this loan will hinder that effort. The last time I tried for a refi, my loan to value was still not good enough so I worked hard on paying down the balance to get me to where I needed to be. I’m where I need to be financially, interest rates are going up and I felt it was time to try again. Based on my last appraisal, I felt that I should be able to get it done. The package delivered by FedEx was my appraisal and was the key to this whole thing so no pressure. It came in even lower than the last one almost two years prior and the housing market has only gotten more hot during that time. Needless to say, I was surprised, disappointed and just a little pissed off. I can go into a whole op-ed piece about he merits of appraising a house using comps and such but that isn’t the point. I won’t let my happiness be dependent on the actions of others such as this appraiser and the status of the loan. I could have made the choice of being the victim regarding this situation and let it ruin my day, my weekend, my week. What I did do was let the anger and frustration flow and I acknowledged it and the let in flow out of me just as quickly as it flowed into me. As Abraham says, I cleaned up my vibration. Setback or opportunity? Some would see this as a setback but it really is an opportunity and I’m grateful for what I have learned from it. I know that this is the way it was supposed to happen and everything is working out for me and I will be OK no matter what.